Venezuelan President Nicolas Maduro has called on the police to act against gangs that are stealing women's hair. The thieves sell the hair - sometimes stolen at gunpoint - to salons where it is used for extensions and wigs. Attacks appear to be on the rise, especially in the country's second largest city Maracaibo, local media report. 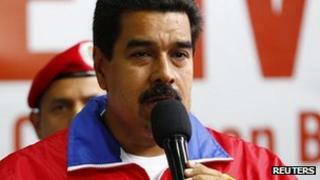 Mr Maduro used strong language against what he called "mafias that cut girls' hair". Speaking at the inauguration of a train station in the capital Caracas, he said the government would guarantee that the thieves would be caught. Several women have reportedly been targeted, being asked to tie their hair into ponytails so that gang members can easily cut it off. However, the BBC's Irene Caselli in Venezuela says authorities are yet to receive any formal complaints. One victim told a local newspaper that she refused to report the case to the police because she feared being teased.